Industries normally plead for lower taxes. But not pharmaceutical units in Himachal Pradesh and Uttarakhand. They want higher excise duty on drugs though they themselves do not pay any excise duty from which they were exempted for 10 years since the year 2003 when the special incentive was announced for setting up manufacturing units in backward areas and in hill states. The Ministry of Home (MoH) finally granted prosecution sanction to the Parwanoo police to proceed against former ADGP BS Thind who was booked for extortion, cheating, criminal intimidation and conspiracy in June, 2008, after Parwanoo-based businessman Ashok Mittal furnished an audio CD allegedly having evidence of Thind demanding lakhs from him in lieu of getting his shop vacated. The government is likely to take a final decision on the fate of the controversial Himalayan Ski Village (HSV) in the Kullu-Manali area as the company has filed its reply to the show-cause notice issued by the government. Taking strong note of a large number of doctors and other medical staff working at places other than their place of postings, the health directorate has issued strict instructions to all Chief Medical Officers and Block Medical officers to immediately stop the practice of deploying the staff on deputation. Eleven persons were killed and five seriously injured in a fatal accident near Jaghoti Nullah, 12 km from Rohru, when a Mahindra Max (HP-01-3631) in which they were travelling rolled down into a deep gorge. 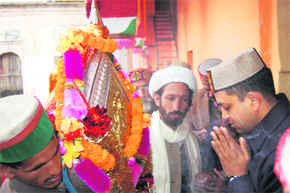 With the arrival of Kamrunag, believed to be the Rain God, along with the three other main deities in this temple, the international Shivratri fair today made a traditional beginning after Mandi DC Amandeep Garg received the Kamrunag in the premises of the Rajmadhav temple, the seat of presiding deity of the Shivratri fair here. Palampur Agriculture University (PAU) has come out with a booklet to help common farmers compute economics of their crops using simple methodologies. Dr Tej Partap, Vice-Chancellor, PAU, while releasing the bulletin, said it was imperative to provide precise knowledge and technology to farmers right from seed selection stage to marketing of their crops. He appreciated scientists of the Department of Agricultural Economics for bringing out the bulletin and the district agricultural plans, which had been appreciated at the national level. Public Works Minister Gulab Singh has directed district magistrate Devesh Kumar and sub-divisional magistrate of Pangi Karam Singh Choudhary to intensify the joint search operations to trace and extricate bodies of three deceased who died in an avalanche that struck Hudaan Bhatori village yesterday. Local trekker Deepak Sharma, a resident of Chari road here, lost his life due to recent spell of snow in the Dharamsala area. According to sources, Deepak along with his friend Shavinder climbed to Triund on Monday evening. The police today produced two accused in the judicial court and got their remand extended for seven days for further investigation into the alleged murder of Sonu Dadwal of Jassur whose body was found under mysterious circumstances near a railway crossing on the night of February 7. The Vigilance police intercepted a private car, driven by Raj Dev Jasrotia who was travelling to Palampur after relinquishing charge of the Tissa SDM, near Tunuhatti, and recovered cash amounting to Rs 11.9 lakh from the vehicle. STEPS, the school division of the TCY, is holding a regional-level “mock test” of the CBSE (mathematics) for class X students of the CBSE on February 14 at all its 30 centres in northern region. But upset with the central government’s earlier decision of reducing excise duty on drugs from 16 to 4 per cent as part of the stimuli and apprehensive that the lower rate could continue for another year, they are now publicly pleading for a higher excise duty of 16 per cent on units in the rest of the country. Expenditure on drugs, they argue, has not come down due to recession because pharma industry is “recession-proof”. Indeed the demand for drugs has been growing between 15 to 20 per cent per annum. Nor, they say, have the prices of drugs come down with manufacturers not passing down the tax relief to the buyers. So, there has been a revenue loss to the government without any corresponding benefit to the consumers, they plead. But the reduced central excise duty has wiped out the advantage pharma units enjoyed in Himachal Pradesh and Uttarakhand. The incentive had drawn them in droves after the policy was announced in 2003. Hundreds of big and small pharmaceutical units, along with ancillary units, sprung up in the two states. All big names in the industry like Panacea Biotech, Nicholas Piramal, Cadila Healthcare, Cipla, Wockhardt and Dr Reddy’s Lab marked their presence. With cost of production higher outside these two states, it made sense for them to start manufacturing in HP and Uttarakhand. But no longer. “Continuation of 4 per cent excise duty on drugs will mean a ‘death nail’ on all pharmaceutical manufacturing units in the two states,” asserts Randolph C. Alves, managing director, Alves Healthcare Private Limited. He maintains there is a strong case for restoring excise duty to 16 per cent. While some pharma units have already shut down their units in the two states, others are struggling for survival, the industry spokesmen claim. And in case the higher excise duty is not restored, companies will be constrained to move the judiciary and raise inconvenient questions like whether the decision was politically motivated or taken to favour large corporate houses. Chairman of the Federation of Pharmaceutical Entrepreneurs RK Arora pointed out that the differential of 4 per cent was negligible and was offset by the cost of transportation of basic raw materials. The grant of much-awaited sanction would help investigating agencies to quicken pace of the case. Sources revealed that the challan had already been finalised and it was being scrutinised following which it would be put up before the court. Since the case involved a former ADGP, police officials were leaving no stone unturned to make a strong plea before the court. The ADGP who was posted in the State Human Rights Commission when the case was registered was later suspended. He was booked under Sections 384, 420, 120-B and 506 of the IPC and Sections 9 and 13 of the Prevention of Corruption Act. The 54-minute audio CD contained detailed conversations of the deal and the sources revealed that this had cast a shadow of doubt over the role of at least two more SPs. The matter pertained to 2004 when Thind was the ADGP handling crucial departments, including law and order and the CID. A dispute was reportedly going on between Mittal and his brother regarding vacation of a shop at Parwanoo and a deal had later taken place between Mittal and Thind wherein the latter had promised to get the said shop vacated provided a sum of Rs 6 lakh was given to him. Mittal had reportedly recorded this conversation and it was handed over to the State Vigilance and Anti-Corruption Bureau along with a complaint by Mittal in 2008. The police had investigated various aspects of the case and the authenticity of the voice in the CD of being Thind’s had been established by the report of the Forensic Science Laboratory. Though Thind had dilly-dallied for months and had refused to show up for taking his voice samples, the delay had failed to yield any benefit. It was on February 5 that the company sent its reply to the Secretary, Tourism, in response to the show-cause notice issued to it by the department in mid January. The HSV had been given one month’s time to file its reply to the notice in which certain issues had been raised with regard to the coming up of the project, being termed as one of the biggest foreign direct investment (FDI) project. It is now likely that a final decision on the fate of the project would be taken by the Cabinet once Chief Minister PK Dhumal returns from his foreign trip after February 17. It was at its meeting held on December 7 last that the Cabinet had taken a decision to issue a show-cause notice to the company after certain apprehensions had been expressed by the high-powered committee which had specially been constituted to look into the matter. It is reliably learnt that promoters of the HSV have tried to clarify doubts in the mind of the authorities with regard to environmental clearances. In the notice it had been pointed out that the environment clearance had not been sought either from the state or the Centre. “The promoters have clarified that environmental clearance was never supposed to be a part of the detailed project report (DPR) as this was to be taken later,” said official sources. The promoters had also tried to stress upon the fact that it was only a section of people who were opposed to the project. They have, time and again, pointed out that the project would generate direct employment for at least 3,500 persons while the indirect benefits would accrue to a much larger population once the project became functional. Even though the HSV project had run into rough weather ever since the BJP assumed power in December, 2007, the future of the project appeared bleak after the tumultuous public hearing which was held at Kothi near Manali on June 6 last year. A large number of locals had not just registered their protest against the coming up of the project but the situation had rather turned violent. In fact, the BJP, while in opposition, had said it would not accept the project in its present form. Now it remains to be seen if the project is given a go-ahead or it also ends up in a legal wrangle like the Brakel case. Taking strong note of a large number of doctors and other medical staff working at places other than their place of postings, the health directorate has issued strict instructions to all Chief Medical Officers (CMOs) and Block Medical officers (BMOs) to immediately stop the practice of deploying the staff on deputation. These instructions, which were issued by the government about a month back, have instructed the CMOs and BMOs to cancel all such deputation and have told them clearly that they only would be responsible for any violation of these rules, including audit paras framed by the audit teams in this regard. This step has been taken by the state government to put a check to “manipulation of a few doctors and other staff” who had been managing deputations through respective CMOs and BMOs to remain posted at the stations of their choice. While many of such doctors and other health officials are posted in the rural areas, they are working in the district hospitals and other urban health centres through deputations and drawing their salaries from rural centres. This practice has also created shortage of medical and para-medical staff in many rural areas, which people of the area had been resenting. Since the staff deployed on deputation have been drawing their salaries from other places of their posting, this has also invited piling up of audit objections. After issuance of new instructions from the state government, the CMOs and BMOs would be held personally responsible for any violation of these instructions. The mishap took place around 5 pm when Nepalese labourers along with some locals were returning home after work. According to the police, while 10 persons died on the spot, one person succumbed to his injuries at the Rohru hospital. The five seriously injured have been admitted to the civil hospital at Rohru but were referred to Indira Gandhi Medical College (IGMC) at Shimla. The vehicle was on its way from Rohru to Summerkot when the mishap took place. The four locals who died include Rajeev Nath of Samrol village, Loba Ram of Salasar, Pradeep Kumar of Babnoli and Tibru Ram of Balaun Kainchi. The other bodied were yet to be identified at the time of filing of this report. The police was still in the process of identifying the bodies, which included four Nepalese labourers including two men, two women along with their two young children. With the vehicle rolling down over 100 feet into a deep gorge, rescue operations by the police and the local administration with the help of locals was carried out with great difficulty. Rohru MLA Khushi Ram Balnatah has expressed grief over the accident and expressed sympathy with the grieved families. He directed the local administration to extend all help and assistance to the families of those killed and injured. The temple town echoed with tunes played by bajantris, the devtas’ traditional musicians, when the devtas made their way into the town. The processions were first received traditionally by the mela committee and the “jhari” on the outskirts of the town. After their welcome, the Kamrunag procession entered the premises of the Rajmadhav temple. Then followed devtas Sukhdev Rishis (Thata), Bara Bingal, Jhathi Bir, Dev Dagandu and Devi Bagla Mukhi. Devlus, the villagers who accompanied the devtas, appeared in a festive mood as the three-day-long rain and snow spell in the region had brought smiles on their faces. While the Kamrunag camps in the premises of the Tarna temple at the hilltop of the town and does not participate in Jaleb procession, other devtas have their own traditional spots for the fair. The rest of over 215 devtas, invited for the weeklong Shivratri fair, would start arriving here tomorrow. They participate in the first traditional Shivratri jaleb from Rajmadhav temple to Paddal Maidan on February 13. The mela committee president performs the traditional puja at the Bhootnath temple, the symbol of Lord Shiva. Meanwhile, apart from cultural nights, the mela committee is organising sports, including shooting, wrestling, kabaddi and volleyball, marathon and competitions for children and bajantris during the show. Mandi SP SM Agnihotri said the police had made all arrangements to maintain law and order and security arrangements of the devtas during the fair. Traffic will be diverted from the Seri Munch side during the cultural nights and additional force has been deployed to keep a close watch on anti-social elements, he added. Himachal Governor Urmila Singh and Chief Minister Prem Kumar Dhumal have greeted people of the state on the eve of Maha Shivratri. Urmila Singh said Shivratri was a famous religious festival and was celebrated by the people from all walks of life with great enthusiasm. Dhumal also greeted the people on the occasion and said people had been celebrating the festival with traditional fervour and gaiety in different parts since time immemorial. He said Himachal Pradesh was known as the abode of Lord Shiva and Shivratri fair in the state had a special significance. The VC said Himachal Pradesh was known for its achievements in fruit and off-season vegetable cultivation throughout the country. While the process of globalisation had exposed the hill agriculture to a number of challenges, it had also thrown open a number of opportunities to earn more. In order to benefit from these opportunities, farmers needed to think on commercial lines. “Keeping in view their basic resource endowments, the bulletin will guide the farmers as to which crops or agricultural enterprises they should choose, what steps should they take in order to understand the prevailing market conditions, what steps should they follow for keeping accounts of their crops or enterprises and how its economic analysis or evaluation is to be done,” he said. As such, it becomes pertinent that our farmers do the economic evaluation and analysis in a scientific manner so as to rightly ascertain the profitability of these enterprise or crops, he added. He expressed the hope that the new bulleting would satiate the information need of the farmers. Dr Hans Raj Sharma, professor and head of the Agricultural Economics, while elaborating the concept behind new booklet, said his department often received queries on various aspects related to crops and marketing from the farmers. A small bulletin in Hindi had been published to elaborate the methodologies of economic evaluation for the benefit of the farmers and officials of various allied departments. Dr Sharma said the bulletin contained a number of examples explaining as to how one should compute the cost-benefit ratio, payback period and internal rate of return of various enterprises with long gestation periods such as dairy, orchards and poly house cultivation. It also explained as to how economics of various seasonal crops such as maize, peas, tomato, potato and gladiolus should be computed. In addition, it would help the farmers to know whether enterprises such as beekeeping and mushroom would prove to be beneficial or not given the prevailing demand and supply scenario. Concerted efforts were underway to rescue residents who had been stranded in the village. The village is about 20 km from Killar, the subdivisional headquarters of Pangi tribal subdivision having an arduous access. In an official communiqué issued here today, Devesh Kumar told the media that the helicopter of the state government had already been pressed into services to locate the affected village and trace the missing people but was facing difficulty because of heavy snowfall in the valley measuring more than 100 cm. However, the search operation, which had been launched yesterday, was still going on and would continue till the villagers were not rescued. He said foodstuffs and other edible commodities were being carried in the helicopter along with requisite medicines and other material, including warm clothes, pullovers and tarpaulins, to save the residents stranded in the snow. The DM appealed to the stranded villagers to burn smoke in the village so that it could help indicating the crew of the helicopter in locating the village and tracing them. As soon as the village is located the rehabilitation activities would be undertaken, the DM said; adding that initially endeavours would be made to lift the villagers by helicopter and bring them to Killar. Next day there was heavy snow in the area and both got struck in snow. While Shavinder managed to go ahead Deepak got trapped in snow. Shavinder tried to rescue him but failed. After failing to rescue his friend Shavinder left him and managed to reach a guest house in Triund. The next morning when he along with others reached the spot, Deepak had already died due cold in the night. Kangra SP Atul Fulzele said the news regarding the boys trapped in Triund was brought by a foreign trekker who came down to Dharamkot last evening. Deepak’s body was brought down today and Shavinder was also rescued, he said. The trek to Triund is about 8 km uphill from Dharamkot. 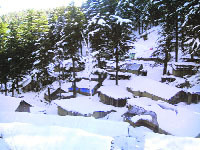 Though it is a favourite spot for tourists in summers, the trek is avoided during winters due to hostile weather conditions. Initially, the police had registered an accident case in this connection as deceased was run over by a truck (HP40-4541). But family of the deceased suspected foul play. According to Kangra ASP Ashok Kumar, the police after preliminary investigations had lodged a case under Sections 302 and 120 (B) of the IPC and arrested Govind Pathania, alias Bobby, of Bharmolli village and Anand Singh, alias Nandu, of Rod village yesterday. The suspects had earlier applied for interim bail but their applications were rejected and the police arrested them. The operation was carried out by a team headed by SP Pritam Singh on the basis of a secret information that the officer, during his posting in Tissa, had taken money from micro-hydel projects and that he would be carrying the amount along with him in his vehicle. IGP SR Mardi said Pritam Singh and DSP Arvind Chaudhary intercepted the white Hyundai car (HP44-0029) at the Tunuhatti barrier and recovered the cash. The officer had been arrested and a case under Sections 7 and 13(2) of the Prevention of Corruption Act had been registered against him. According to the TCY press release issued here today, the CBSE mock test will be conducted at more than 30 centres of STEPS, BETTERTHINK and TCY in north India on Sunday. “This will be conducted simultaneously in Chandigarh, Punjab, Haryana, Himachal Pradesh and J&K,” it claimed. More than 5,000 students from top schools of cities like Chandigarh, Ludhiana, Jalandhar, Amritsar, Patiala, Karnal, Jammu, Mandi are expected to participate in the exam.